The Inkpen Authoress: I'm Not a Real Writer, I Guess. Stereotypes can either amuse or annoy me. I laugh when people stereotype some things because it is funny to me to see what strikes a person enough about a category to paint that thing with a broad brush across the whole category. But some stereotypes are especially wrong and none more so than when it comes to The Stereotype of The Writer. According to those, you would not recognize me as a writer. I am connected with many writers on Pinterest, but when I scroll through my feed, I very rarely repin anything "about writers" that I find. Why? Because I don't fit the apparent stereotype of the writer and by those standards, I wouldn't be here publishing my third book. Here are some of the most presumptuous of all, and what I, as a writer, am really like. I have never written a mid-night sentence in my life. My best ideas come during the daytime when my hands are occupied with cutting vegetables or washing dishes or vacuuming. 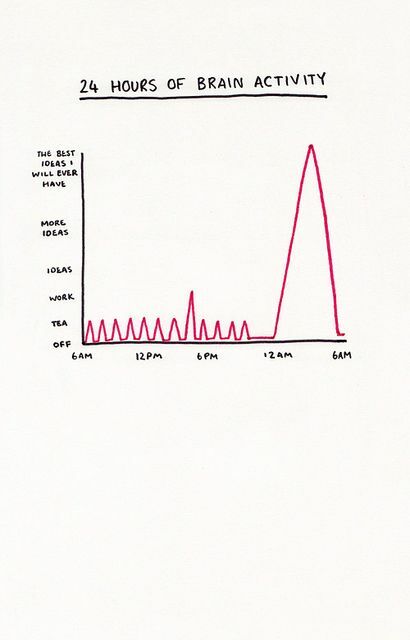 Contrary to this chart, if I don't get enough sleep, my creativity gutters out. Not a good idea when you're living (in a way) by your wits. Almost without exception, my characters either come with names or have one attached to them within a day or two. 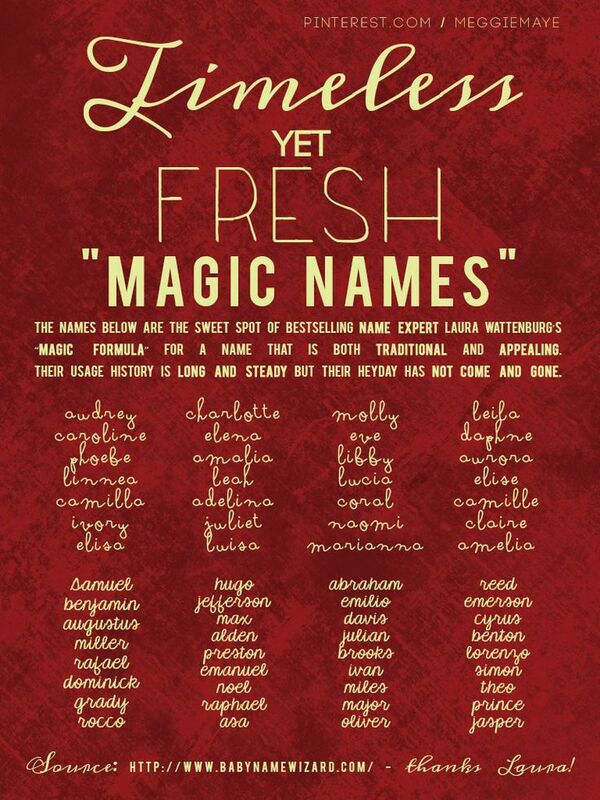 I don't fret over the meanings of the names. The way I find a good name is by trying a couple on for size and seriously evaluating if I could stand to live with that name for the next 80,000 words. Also, convenience in typing. I hate hard-to-reach monikers. This is, perhaps, the biggest bone I have to pick. 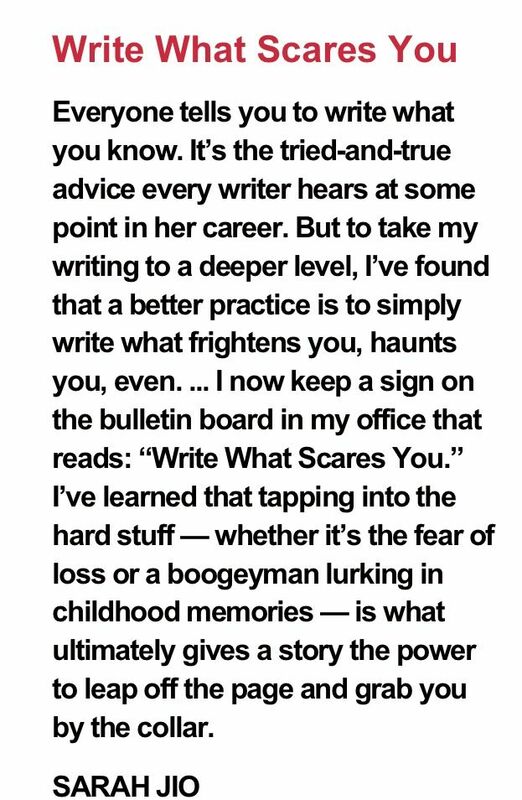 Yeah, It's important to dig into those tough spots for tough spots but unless you write horror or emo-fiction, this advice is especially presumptuous. And it's everywhere. I agree that you need to address and harness your fears, passions, struggles, etc., but using them all at the same time all the time is overkill. Honestly. The places where they could be used effectively will be drowned in melodrama. No one likes a hypochondriac. 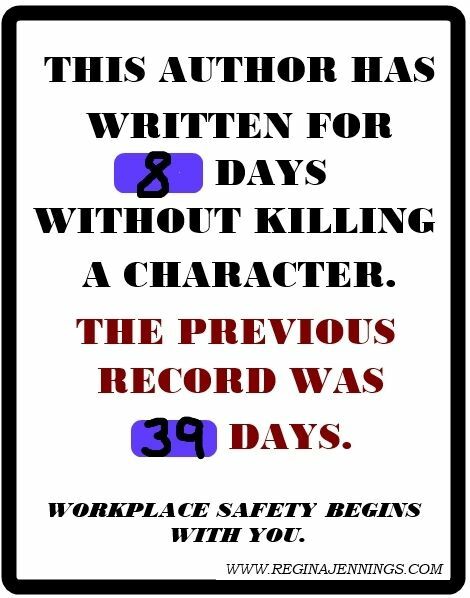 I have killed three characters in all my books (two were murder victims). Even in the ones that will never make it to the public's view. Not that killing characters doesn't have its place, for it can be quite effective in its moment. But killing characters is pretty cliche when it is your go-to. There are so many other ways you could deal with a character, and if you're looking for an addition of misery, try not killing a character. Instead of killing him so that his kids are orphans, what about removing him to a place worse than death? Or, as they did in Once Upon a Time, making a character remember in a place where everyone else has mercifully forgot? There are many ways to add drama, misery, grief, and even despair without killing a character. Death is natural. It'll happen to everyone. There are other ways to deal with a dull character. Yes, like everyone else, I do go through what Abigail calls "The Crap Cycle". But most days, I feel pretty good about my writing. Perhaps this is not so much a product of over-confidence as it is common sense. I have seen a pattern. I know that my writing will need editing, rewriting, and more hard work but it always does. It always will. I have the grace to look past its current flaws and see what it can and will be. No freak-outs. Well, extremely rare freak-outs. But this is just me. I know that I don't fit the stereotypes and I don't mean to make a new stereotype by saying all writers do not fit the "norm". What about you? Do you relate more to the status-quo or do you find yourself disagreeing and scanning for another pin? None of these things apply to me - except some form of the last one. But, yeah, I don't really get why writers are expected to be certain things. At first I kind of felt like a lot of writer stereotypes fit me or rather *should* fit me but you know what--they REALLY don't. You and I are very similar in all these ways above but for my confidence/common-sensical approach/view of my writing which needs work. Actually, the first two describe me so much that it's scary- I always get my best ideas, and I mean perfect-sentence-plots-andquotes ideas- while i'm in bed and then by morning I forget them. It's tragic. And I don't normally have a probably picking out names, but I'm just obsessed with names and meanings and such in general; it hasn't nothing to do with being a writer. I sometimes feel that writing is one of the most relatable things. No matter how different you are from another writer or how different the genres you work in, there are some aspects of the process that you always share an understanding of. But you're right, not every cliché is universal. I've never really pulled an all-nighter either. Maybe...three times?...an evening writing session has gone late because a story was really flowing and I didn't want to stop. I finished Corral Nocturne at midnight, appropriately enough. But you are absolutely right: if I don't sleep, I feel awful during the day—dull and lethargic and with a mind utterly unfit for creativity. Character names? One of the easiest and most fun parts. Killing characters? I started out at the opposite end of the spectrum; it took me years to get up the nerve to do it even when necessary. And so far as I'm concerned, "darkness" in whatever form is one of the most irritatingly overdone things about modern fiction. From one non-stereotypical writer to another, ignore the stereotypes. ;) If I fit most of the above, I would get nothing accomplished. There is no right way, just the one that fits you and helps you produce your best work. :) Enjoy it and the freedom of being different. Ha, only a couple of these stereotypes describe me... 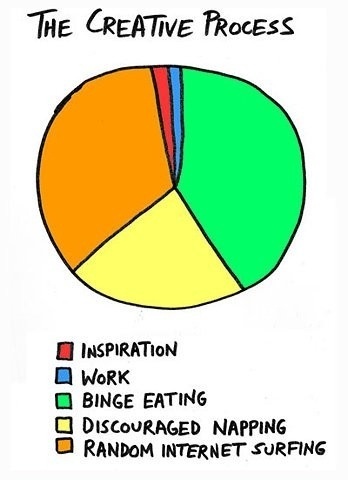 I generally write between 8 p.m. and 2 a.m. And the last one DEFINITELY applies to me...if you switch out the section for "binge eating" with "random internet surfing", and vice versa. And I generally am pretty down on my writing.